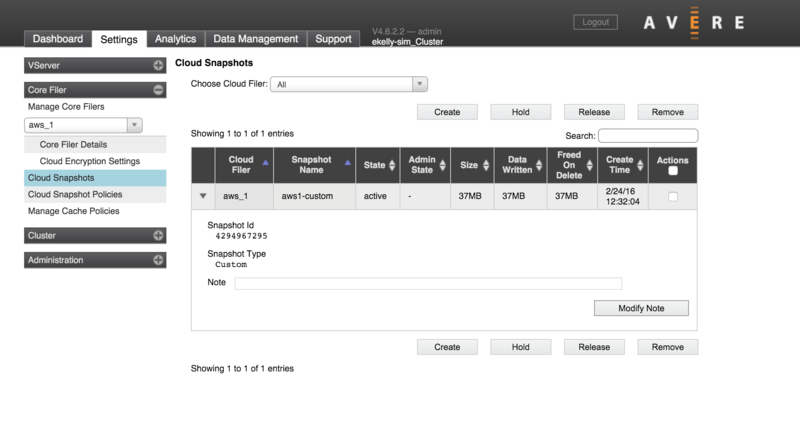 The Cloud Snapshots page lists the existing snapshot files for core filers in this cluster. You can delete snapshots, or protect them from deletion. This page also allows you to create a manual snapshot. Use the Choose Cloud Filer drop-down at the top of the page to show snapshots from one core filer only. Click the triangle at the left of a snapshot row to show or hide details. The table provides these details about each snapshot. Names for automatic snapshots (the result of snapshot policies) include the schedule type (hourly, daily, weekly, monthly), date (YYYY-MM-DD), and time (HHMM). Names for manual snapshots are specified by the administrator when the snapshot is created. The amount of disk space used by this file. If compression is enabled for the core filer, the snapshot size might be smaller than the size returned by a disk usage query on the core filer. The buttons above the snapshot table include options to delete snapshots or protect snapshots from automatic deletion. Manual snapshots are not automatically deleted, but snapshots created automatically by a snapshot policy are automatically deleted according to the policy’s Maximum Snapshot Count settings. If you want to prevent a particular snapshot from being deleted, use the Hold feature. Select one or more snapshots in the table using the Actions checkboxes. To create a new snapshot immediately, click the Create button at the top of the page. A window pops up and allows you to configure a manual snapshot. Choose the core filer to snapshot, and enter a name for the snapshot. Including a note is optional. Click Create Snapshot after setting up the operation. Snapshot creation might take several minutes. After a few moments, the new manual snapshot appears in the table, under the name specified in the dialog. Clients can experience high latency during snapshot creation because Avere OS disables write caching in order to create the snapshot. Writing file changes to the cloud core filer instead of to the cache can be significantly slower. You can use a snapshot to restore changed or lost files. You must use the command-line interface to restore files from a snapshot. All snapshot files are read only. Navigate to the mount point destination. Change to the .snapshot directory. List the folders in the .snapshot directory and change to the directory that corresponds to the snapshot that you want to use. Manual snapshots are stored in a directory labeled with the snapshot name; automatic snapshot directories are named with a combination of the snapshot name and the date and time. Locate the file or files that you want to restore and copy them from the snapshot directory to a convenient location on the local machine.